T-Rex (meaning “Tyrant lizard king”) was one of the world’s largest meat eating dinosaurs at 40 feet long, 15 feet high and weighing 5 to 7 tons. T-Rex roamed the earth 68 to 65 million years ago and was known for its large, powerful jaws and fearsome look. Interestingly, for such a large animal, the hands and arms, though powerful, were quite small. This T-Rex dig was cast off the second most complete T-Rex specimen in the world. This is the T-Rex on display at the Chicago museum. 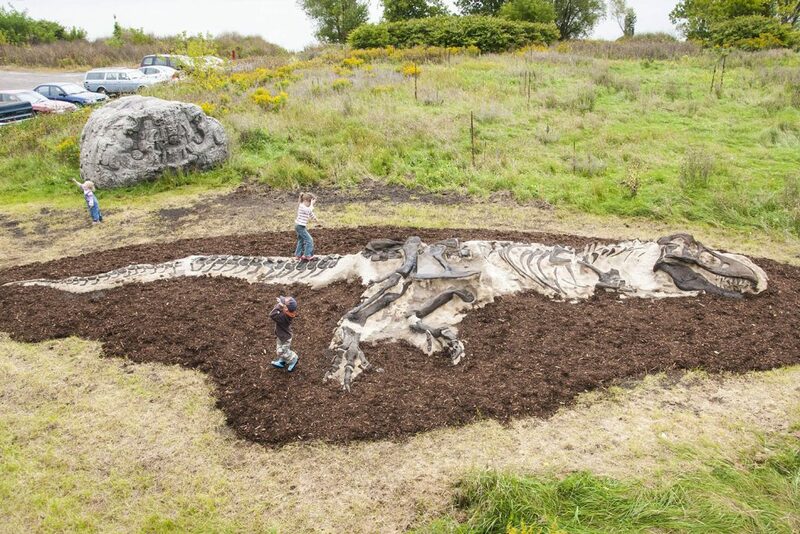 Bury this skeleton under sand and watch children be amazed as they uncover this huge life size T-Rex. Dimensions – 36′ long (11.0m) x 14′ (4.3m). ClimberGlass Fiber Reinforced Concrete (GFRC): A concrete mix reinforced throughout with chopped glass fibers. Cement used shall be Type 1 Portland cement meeting the requirement of the ASTM C 150. Fine, clean, dry sand, able to pass a No. 20 sieve, free of contaminants or deleterious matter and meeting composition requirements of ASTM C144. Glass Fibers specially designed for use in concrete; shall be alkali-resistant (AR) fiber and chopped to 18mm lengths, with 12mm lengths in any topical coat. Concrete shall have integral color that shall be harmless to concrete strength, alkali-resistant, shall not to exceed 10% of amount of cement, and conforming to the requirements of ASTM C979 for color steadfastness. Minimum physical properties shall be: 1500 pounds per square inch in tension and 5000 pounds per square inch in compression. None Required. 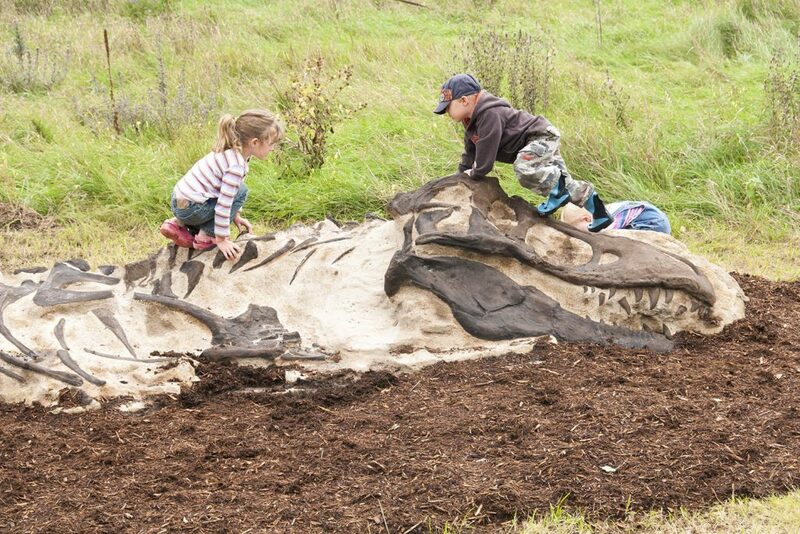 T-Rex is designed to be buried in sand and children’s feet remain in constant contact with the ground. The images above so the T-Rex uncovered for display purposes.